Many in the GOP like to point out the fact Ronald Reagan’s economic recovery was much stronger than the current one. The reason being, they argue, was that Reagan’s policies were better than Obama’s. Let’s look at the details of the two recoveries. The current recession began 53 months ago. Reagan’s recession officially began in July 1981 – so 53 months later would be Dec 1985. Total government spending was up 43% and increasing. Government employment was up 500,000. The highest income tax rate was 50%. Total government spending is up 20% and stalling. Government employment is down 400,000. The highest income tax rate is 35%. It’s true that this recovery is more anemic than the 1980’s recovery. But the things the GOP are advocating – smaller government, austerity and low taxes – are more true today than they were then. Pretty ironic, isn’t it? For anyone interested in the main difference between the two recoveries – it’s housing. 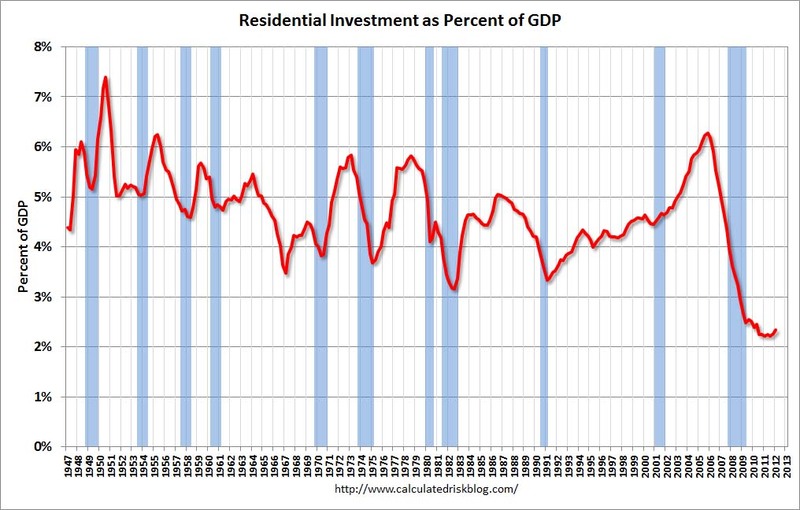 If we had the kind of home building today as we did in Reagan’s recovery, GDP would be 2.7% higher. This would take GDP growth from the latest 3% figure to 5.7%, and the GOP would need a new campaign strategy. You neglected to mention that Reagan came into office facing a very difficult conundrum: Stagflation had resulted in high unemployment and slow growth, with simultaneous double-digit inflation. For the first time ever, polls showed that Americans considered the worsening inflation as at least as big a problem as unemployment. Keynesian stimulus could only end up making inflation worse. But by the end of Reagan’s first term, both inflation and unemployment were cut sharply, something that liberal economists like John Kenneth Galbraith had said was simply impossible without wage-and-price controls. That was also Ted Kennedy’s “solution.” But as it turned out, they were flat wrong. It proved possible to stimulate the economy while taming inflation simultaneously. I would like to see how a doctrinaire liberal like Obama would have tackled stagflation. I’ll bet he would have done what Galbraith wanted–and imposed wage-and-price controls followed by rationing of consumer goods. I think Obama came into office facing a pretty difficult conundrum as well. Reagan was able to increase government spending and cut taxes because tax rates were high and government debt was low. Obama doesn’t have that luxury. « Stronger Economy – Blue States Or Red States?